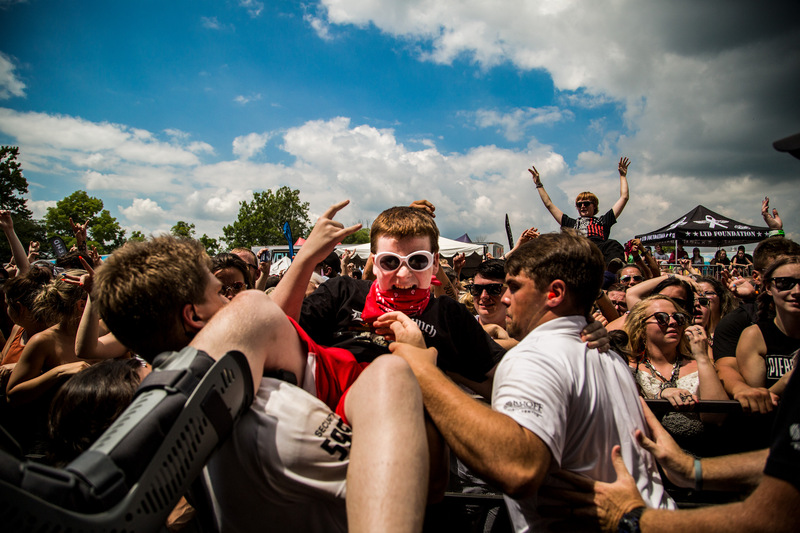 The internationally recognized Vans Warped Tour music festival made its last ever visit to Noblesville, Indiana while on its final trek across the U.S. on Tuesday. In November of 2017, festival founder Kevin Lyman announced that 2018 would be the final, full-cross country run of the Vans Warped Tour. “It will be bittersweet each morning when I see the sun rise and then watch it set knowing that this will be the last time I get to witness it from that exact spot.” Lyman said during an interview with Billboard Magazine. The tour was first conceived in 1995 as an alternative rock festival, but later began focusing on punk rock music. The festival currently plays host to more than fifty musical acts ranging in a variety of different genres. The day started off beautifully with temperatures rising to only the low 80’s. Anyone who has ever attended a Warped Tour knows that this is relatively low compared to the lower to mid-nineties of years past. Festival goers were lined up as far as the eye could see outside the venue waiting to get in and begin what may be their very last Warped Tour experience. Some of the first bands to take to the stages for the day were rock bands Four Year Strong, Issues, We the Kings and Wage War. All four bands took control of their stages and set the tone for what would turn out to be a day filled with lots of excitement and memories. Because this is the 24th and final year for the Vans Warped Tour, the festivals management team made it a point to bring back some of the most iconic acts from years past. One of those bands included electronic pop group 3OH!3. Making their first Warped Tour appearance in 2008, the three-piece act was greeted at their stage by an enormous crowd of ecstatic fans. Lead vocalist duo Sean Foreman and Nathaniel Motte energized the crowd with their playful stage presence and recognizable song lyrics. The band performed several crowd favorites off of their first album, including hits such as DONTTRUSTME AND STARSTRUCK. As the day went on, the stoke level throughout the festival continued to rise. Musical acts Real Friends, Movements, Crown The Empire, Unearth and Ice Nice Kills all proved that they were going to give everything they had during their last performance in Noblesville. Among these bands, veteran Warped Tour act Reel Big Fish made quite the splash as well as they took to the Journey’s Left Foot main stage. Making their festival debut all the way back in 1997, the 6-piece ska/rock act put on an incredible performance that had festival goers on their feet for the entire set. Lead vocalist and guitarist Aaron Barrett fronted the group while trumpet player John Christianson and saxophone player Matt Appleton backed him up with their amazing instrumental talents. 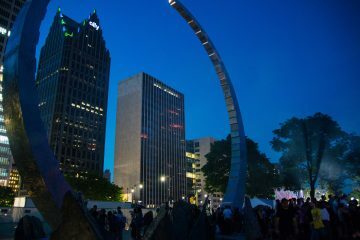 As the festival roared on into the evening, excitement amongst fans began to build for one of the day’s most anticipated acts; the legendary punk rock group Joan Jett And The Blackhearts. Having released their first album almost twenty-eight years ago, the four-piece act based out of New York City, New York put on a tremendous performance on the Journey’s Right Foot main stage. 59-year-old lead vocalist and guitarist Joan Jett stunned the crowd as she took the stage with as much energy as she would have twenty years ago. The group performed several crowd favorites such as Bad Reputation and Cherry Bomb. The performance put on by the group was even more special to Noblesville fans knowing that their stop was the only stop in which the band would appear throughout the entire tour. Although Joan Jett and the Blackheart’s put on an amazing performance, the day was not over yet. Rock bands Motionless In White, Knuckle Puck, Twiztid, Amity Affliction and In Hearts Wake closed out the day with stellar performances that left fans wanting more. However, the cherry on to top to an already perfect day was getting to watch two of Warped Tour’s longest running bands: Simple Plan and Less Than Jake. Both bands drew some of the largest crowds of the day because of their history with the tour. During their set, Simple Plan released multiple rolls of toilet paper confetti into the crowd in acknowledgement to the fans for supporting both their band and the tour for so long. Both bands also gave thanks to Kevin Lyman, as well as the rest of the Warped Tour staff for allowing them to be a part of such an amazing tour. Overall, the last ever stop of the Vans Warped Tour in Noblesville was one that we will never forget. Aside from this year’s stop, the event has provided an unlimited amount of memories for festival goers in the last twenty-four years. Far Out Midwest would like to personally thank Kevin Lyman and the rest of the Warped Tour team for allowing us to be a part of history. We wish everyone involved all the best in their future endeavors in the music industry.